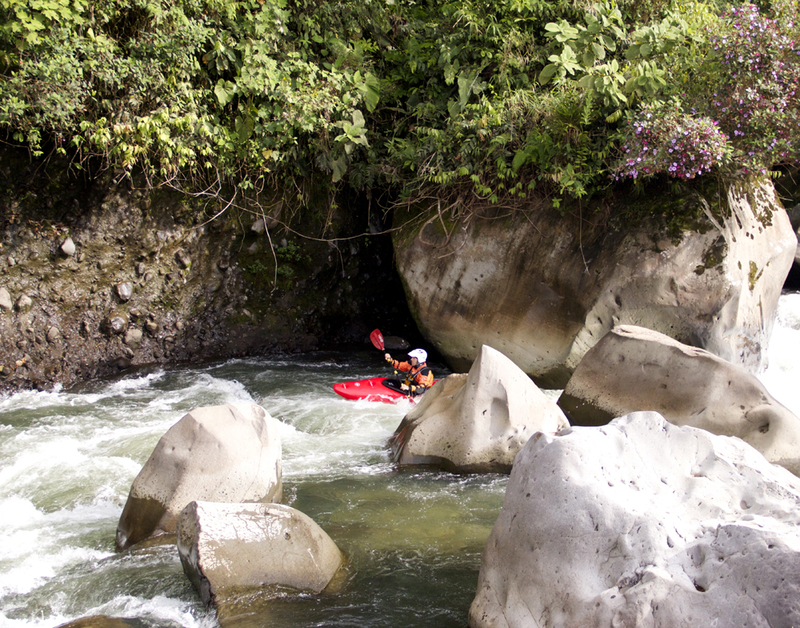 Small World Adventures--Kayak Ecuador: Can You Boat Scout? 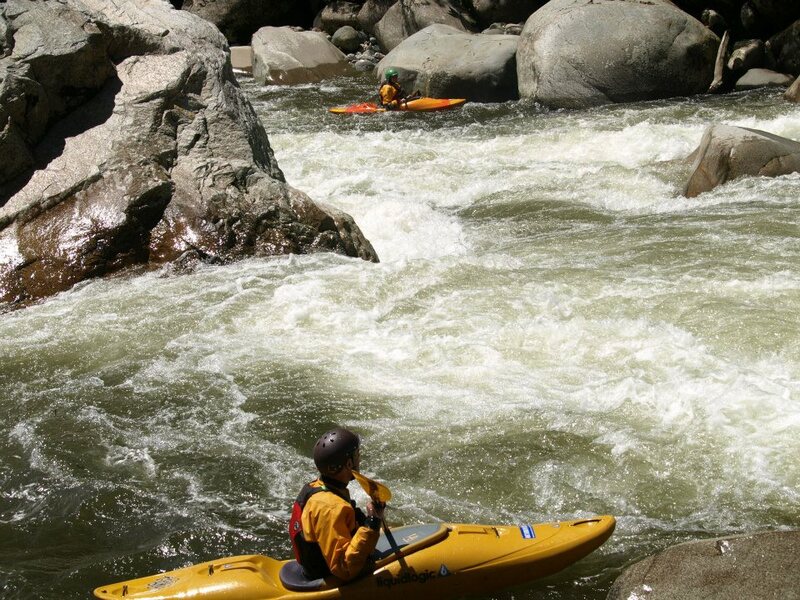 Introduction to Creeking—the importance of boat scouting skills. Boat scouting—figuring out a rapid from in your boat rather than getting out on shore to actually scout—is a highly over-looked, but all important kayaking skill. If you are in a group on a new river that no one knows, it can be crucial to the success of your day that the crew is good at boat scouting. Take Ecuador’s Upper Jondachi for example. It’s only 10km long (6 miles) but is jam-packed with rapids. Most of the rapids are boat scoutable for the skilled boat scouter. On average, this run takes groups where no one knows the run 3-5 hours. If you weren’t confident at boat scouting, you would literally be getting out of your boat 70+ times on this run and it would take you days to finish. But learning the difference between being good at boat scouting, and being reckless and foolishly charging downstream is just as important, if not more so! It’s a common complaint that people can’t practice boat scouting because they are always running the rivers with someone who knows them well. But this just isn’t true! Rene, Keith, Steve, Midge and Matt got in some awesome boat scouting practice on their Intro to Creeking IV- course in Ecuador this past week. 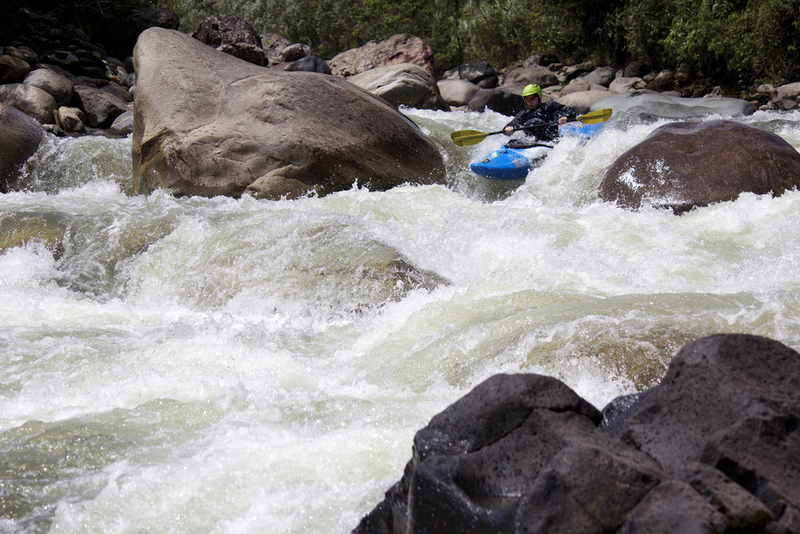 You can always practice any skill on any river whether it’s boofing on a big volume run (off the tops of waves), hole escape techniques on low volume runs, or boat scouting on a river that you or your friends already know. Steve boat scouting his way down the Oyacachi wondering to himself, "what IS wrong with just fun?" 1.) Always see your next eddy and know you can catch it! This is a perfect skill to practice on a known run. Go for really dodgy eddies on a run where you know there won’t be consequences if you don’t catch it. Find your personal limit on catching small and/or sketchy eddies on a run where it won’t matter if you fail to catch the eddy. Then, when you are in a “real life boat scouting” situation where it really might matter if you don’t catch the last eddy above a drop, you’ll have a better understanding of your own skills and tolerance for risky eddies. 2.) Be prepared to be the decider. Once you are in that eddy, have the confidence to make the right call. You usually can’t confer with your boating buddies, so you need to make the decision for yourself and for the group. Is it time to scout because you can’t see enough to safely run the rapid? 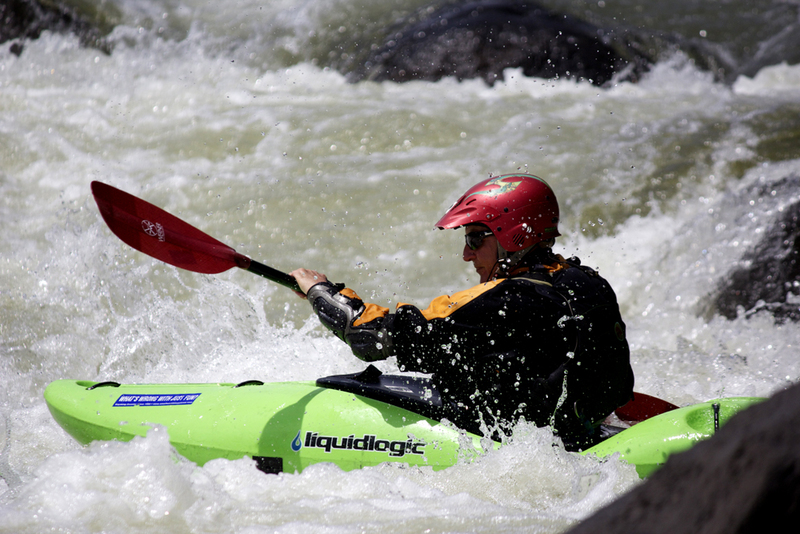 Can you see 90% of the rapid and guess at the rest based on what the water is doing? Is there spray coming up because of a rock in the landing? Can you deduce where the tongue might be based on where you see outflow? Sunset over the bustling city of Tena where we spend 2 nights on each trip. The Llanganate Mountains add the perfect back drop for this adventuresome town. 3.) Don’t leave anything to “luck.” Some things you want to be sure of when boat scouting: Am I sure there are no logs in this drop? 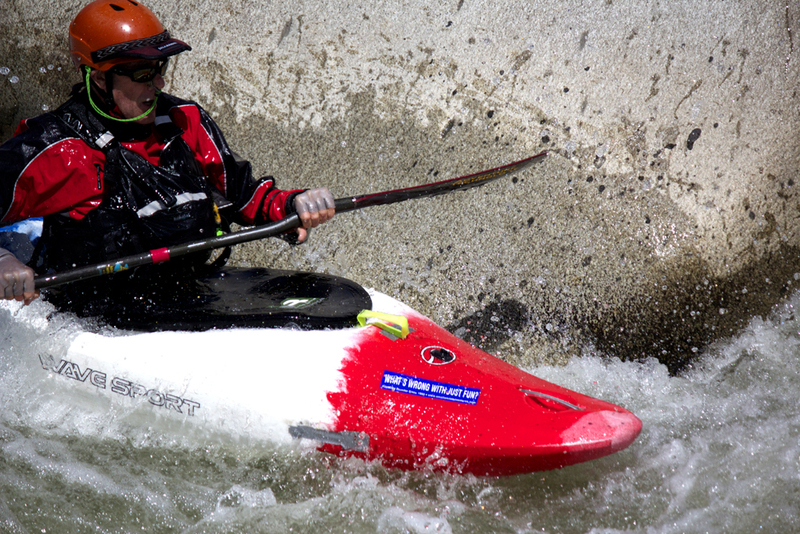 Can I safely make it to the bottom of the rapid? Will the rest of my team safely make it without scouting? Is there an eddy at the bottom of the rapid that I can catch? 4.) Communicate! Once you’ve run the rapid you are boat scouting be sure to communicate with the people behind you. Don’t make them repeat all the same boat scouting steps that you’ve just taken—this won’t save anyone any time or energy. Give them feedback, tell them it’s ok, or tweak the line if you didn’t like yours. The Jefe doing what he does best--playing on the river! 5.) Patience and support from your team make for successful boat scouting. 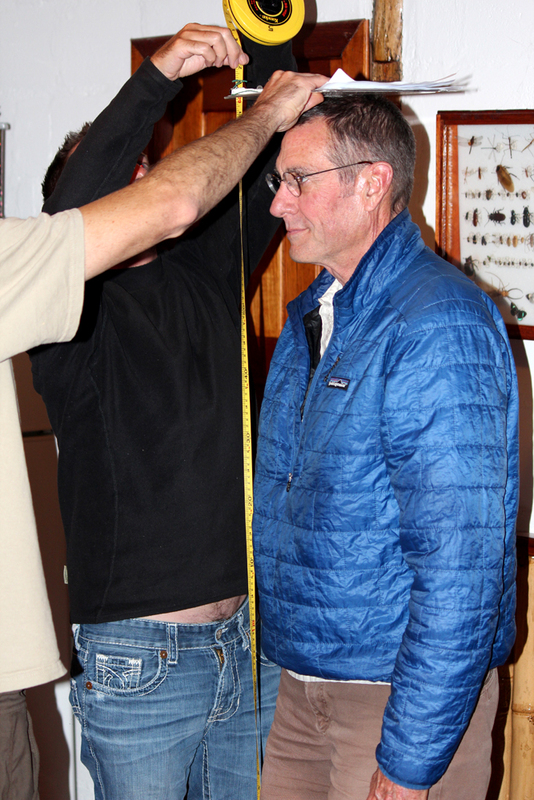 If you are the 2nd boater, don’t pressure the lead boater out of their eddy. Make sure you are close enough to see them, so that you can see the line and help if they get in trouble, but not so close that you are pressuring them to go faster than they might like, or leave their last eddy before they are ready. 6.) Back up is key. As the 2nd boater, your main job is watching and supporting the lead boater. If the lead boat has gone into an eddy where no solo escape is possible it’s imperative that your last eddy have an escape route (easy access to shore) so that you can scout for the lead boater or extract them from their inescapable eddy if need be. (On a side note, it’s not usually a good idea as the lead boater to go into an eddy where you can’t easily get out and scout. It does sometimes happen though and your 2nd boater needs to be able to support you if this happens). 7.) Work as a team! As the 2nd boater, communicate the beta that you and the lead boater are finding back to the rest of the team. You are looking for a quick and safe flow on the river. If each individual is having to boat scout for themselves, that won’t be of any use to the group. Take turns leading, communicate well, always be in line of sight with the person in front of and behind you to facilitate a nice flow of information. 8.) When in doubt, scout. If you ever have any doubts or misgivings whatsoever, get out and scout! Even though it will take extra time, it is worth it. Even if your kayaking friends think you are a “dork,” it’s worth it. I think very few people have regretted getting out of their boats to scout, but many have regretted not scouting. Shopping for lunch supplies in the Tena market. In our Intro to Creeking Course the 2nd week of December, we had ample time to practice boat-scouting, communication, decision-making and sketchy-eddy-catching. These are all skills you should work on on a regular basis. Even if you think you’ll never have the occasion to be the lead boater scouter, all the skills are still worth while. And, it could help make your home stretch that you are bored of exciting again! 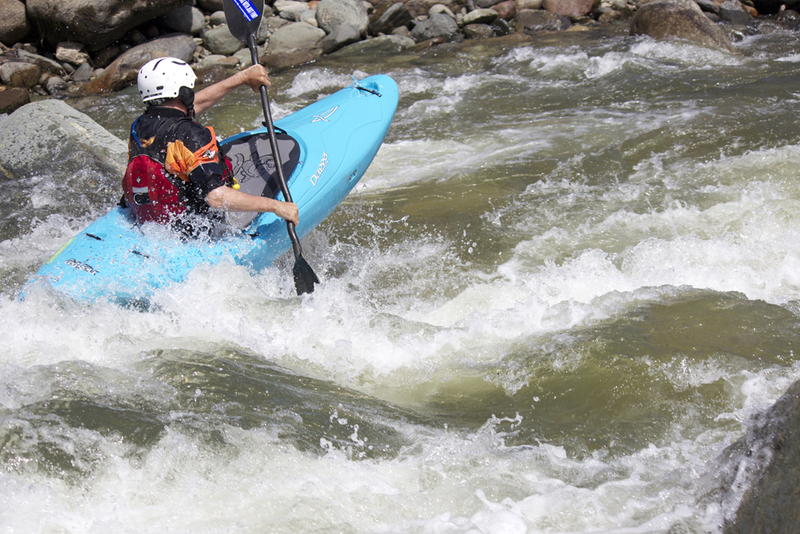 If you need new runs to come boat scout, come on down and see us in Ecuador! It’s the perfect training ground. Liam and Midge enjoying a gin and tonic on the porch after 4 successful weeks of paddling in Ecuador with SWA. Way to go Midge! Win a Jackson Zen October 1st! Win a Werner Paddle on September 15th!